This website is dedicated to helping others in their knowledge of God's Word. The material contained was written by Donald Duane Townsley, a preacher of the gospel of Christ. It was his desire that everything he preached and wrote be used to further the gospel of Christ, and that it be true to the Book. He would be happy to know that he "yet speaketh" (Heb. 11:4). It is the desire of the owner of this website that everything contained here be scriptural and be used for the glory of God. Contained here are articles, sermons and lesson material and audio sermons that he created during his sixty-plus years of preaching. We are constantly adding to the material here, so come back often to see what has been added. Permission is granted to individuals and churches to copy and use the material in this website unedited to spread the gospel of Christ. We ask that you please credit Donald Townsley with writing the material you print out and distribute. As told to Angela Wisdom by her father Donald Townsley. On January 1, 2013 Donald Townsley left this worldly realm. In all his years of preaching the gospel he never wavered from what he believed to be the Truth of God's Word and he preached it boldly with "great plainness of speech". The reason for including the history of Donald is not to promote him, for he never would have wanted that, but is to show others that preachers can come from poor circumstances and do much for the Kingdom of God. Donald never forgot his humble beginnings. He and his wife Sarah used what little they had to help others who were in need. When Donald Townsley was a little boy the Townsley family lived in the community of Happy Hollow in Lauderdale County, Alabama. One would turn on the road going to Cow Pen, go across a small branch called Keifley Branch, and go ½ mile to a house on the left side of the road. The farm there was owned by a man named Bob Kilburn, and the family rented from him. There were 2 houses on the farm, but during the Depression of the 1930’s the whole Townsley clan lived together in the biggest house on the farm. The family survived by raising a lot of their own food. Donald went to school in that community called McGee school, no longer in existence today. Donald went to primer there (primer was like kindergarten), 1st grade, 2nd grade and part of the 3rd grade. World War II started that year. Hitler marched into Poland in 1939, and the United States geared itself up for the war. Wilbur Townsley, Donald’s father, and Wilbur’s brothers were carpenters, so they went to get jobs at Childersburg, Alabama (close to Birmingham) at that period of time. They left there after a time and went to the state of Kentucky for a while. Then they moved back to North Alabama and they moved into the old Townsley home that their mother, Hettie Pearl Townsley, still owned. The old Townsley home was a log house with a dogtrot in the middle. There were two rooms downstairs, and there was an upstairs. It had a kitchen off the back of the house. The house was located on Danley Road in Lauderdale county, and was located on 40 acres of land. Donald went to school at Stony Point school, close to the creek. Then he went to Underwood school until the 6th grade. For a time they lived on a 7 acre farm that Wilbur bought from Foster McClure. Wilbur, his father, bought a farm called the Denson farm. While they lived there, Donald went to Central High school in the 7th and 8th grade. Mars Hill Bible School began in 1947, and he went there from the 9th to the 12th grade. 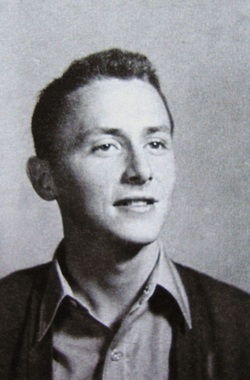 Donald graduated from high school in 1951, and went to Montgomery, Alabama to Montgomery Bible School (now known as Faulkner University). He only went there for one quarter. The school was building some new buildings there, and one could work their way through school by working on the buildings. However, he was not happy there. He transferred to Freed-Hardeman College. They had scholarship money for men who wanted to preach. The tuition was $900.00 per year. That first year his Uncle Lloyd Townsley and Aunt Lucille Townsley helped him. His father also helped him when he could. The next year, he got a job preaching for the Salem church of Christ in Lauderdale County, Alabama for $15.00 a week. They later raised his pay to $25.00 per week. He would get a ride home and back to school with Eugene Pigg, paid him about $2.50 for gas, and put the rest of the money on his schooling. He took Bible classes at Freed-Hardeman for 2 years. He didn’t meet the requirements for a degree because Bible classes were his goal – he wanted to preach. It was during this period of time that he met his future wife, Sarah Ann Call. He continued to preach at Salem, and they raised his pay to $50.00 per week. While there he helped put in 2 elders and 7 deacons. His friend, Raymond Harville, was in Cullman, Alabama, and told him about a church in Vinemont, Alabama that needed a preacher. He and his wife Sarah went to Vinemont, and moved there to preach. He preached for them about 17 months. While he was there his first daughter was born. B. J. Hope was preaching in a meeting in Cullman, Alabama, and he referred Donald to a church in Lebanon, Kentucky that needed a preacher. Donald moved to Lebanon. Lloyd Townsley moved his furniture and possessions on his truck he used in his produce business. Donald lived in Lebanon for 5 years. His second daughter was born there. With two children, he needed more support. He tried out in Memphis, Tennessee. He didn’t go there, but word of his preaching was heard in Louisville, Kentucky. The elders at South End church of Christ were looking for a sound preacher, and they came to Lebanon to hear him preach. They wanted him to come to Louisville, so he moved there. He lived in Louisville for 4 ½ years. It was there that his youngest daughter was born. He held a gospel meeting at the Cyclone church of Christ in Tompkinsville, Kentucky. One of the churches in that area, Grandview church of Christ, needed a preacher. They wanted him to come and work for them. He lived there about 5 years. In 1970, the new congregation, Underwood Heights church of Christ in Florence, Alabama, had begun. They wanted him to come and work with them, so he moved there. The church was small and not self-supporting, so the Collegeview church of Christ in Florence, Alabama supported him at the beginning of his work there. The church at Underwood Heights grew, and became self-supporting. In 1983, he decided to move back to Louisville, Kentucky. This time he went to the Hebron Lane church of Christ in Shepherdsville, KY, outside of Louisville. He worked there for 10 years, and then moved back to Florence, Alabama to work with the River Bend church of Christ. In 2002, he left River Bend, and moved his membership back to the Underwood Heights church that he had labored with years before. The following article was published in "The Voice of Underwood Heights Church of Christ" bulletin in December 1974. At that point in time Donald had preached the gospel for 24 years, a little less than half of the years he preached the gospel before his death. Twenty-four years ago this month (December 1950) I attempted to preach my first sermon. I shall never forget my text -- it was Romans 6: 23, "The Wages of Sin is Death". I preached it at Jacksonburg church of Christ. It was a cold, clear Lord's day morning . I had spent the night with my uncle, Lloyd Townsley, and walked to Jacksonburg to meditate on my sermon on the way. On the way there the Lord and I both knew my sermon, but when the time came for me to get up and preach the only one of us who really knew it anymore was the Lord. With His help I struggled through it. My next try (the next Sunday I believe) was over at Mount Zion. I remember, after my try there, that my beloved great-uncle, Benjamin Wade, came around and paid me a few dollars for what I had those good people to endure! I must say it was great encouragement for me to preach for these brethren and I am afraid we all fail to realize what a little encouragement can do for a person. After Jacksonburg and Mount Zion had "launched" me, the best I can remember the next place I tried my "talents" was at Bethel Berry. At that time Bethel Berry had few in number and met in a very run-down building with brick siding on it which had no class rooms. (I do not state this to cast any reflection on the good brethren who were doing their best to carry on the Lord's work there, but to cause you, the reader, to be aware of the conditions existing twenty-five years ago.) Men like brother Robert Heupel and Floyd Montgomery ( now deceased) encouraged me at Bethel Berry in those early days and years of my preaching. By the summer of 1952 I had been to Alabama Christian (as it is now called) one quarter and to Freed-Hardeman one year and was out for the summer, so the brethren at Jacksonburg were willing to give me another try. I filled in for them most of the time that summer, along with another preacher who preached some. I also preached a few times for Stony Point, my "home congregation", that year. I shall always appreciate the encouragement given me at Jacksonburg by men like brother Troy Miles and brother Columbus Miles and others. Jacksonburg did much to encourage me as a young preacher, and I shall never forget it and shall always appreciate it. The first person I ever baptized responded to the invitation at Jacksonburg, Gerald Briggs (Ed's son), and I baptized him in the Stony Point creek. Twenty-four years ago country church buildings had no baptisteries, and you either baptized someone in the creek or drove to town. 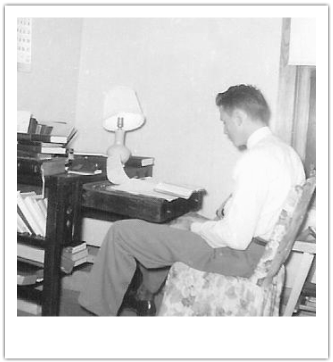 In September of 1952 I began preaching every Sunday for the Salem church of Christ with a starting salary of $15.00 per week. At that time Salem was small in number and met in a frame building painted white, which had (I believe) three classrooms. Salem had been in existence for twenty-eight years and had never had an eldership. This was my first experience with appointing elders, and it was not an experience without some problems. I stayed seventeen months at Salem and the church saw rapid growth. My salary had gone from $15.00 to $50.00 per week. This is a brief remembrance of my early days as a preacher in this county. Brethren, during the twenty-four years that I have tried to preach the gospel I have seen a lot of changes in the church of the Lord. About the time I started to preach innovations began to be introduced into churches on a wide scale. I believe Herald of Truth started on a national network in the fall of 1952, and the institutional orphan homes were growing in number and being pushed to be put in the budget of the churches. The innovations were new to this generation, so for a brief period as a young preacher I gave my endorsement to them before I had studied them. But, as I began to study them in light of the word of God I soon found myself at odds with the practices that were being introduced because I could find no Bible authority for them. In sorrow I must say that the majority of churches and preachers did not reject these innovations. Here I want to state some of the changes I have seen: I have seen churches become prosperous and fat in material goods; I have seen churches go from run-down , inadequate buildings to the other extreme of building big, expensive buildings that the next generation will have to help pay for; I have seen preacher's salaries go from small, inadequate ones to good salaries; I have seen many churches go from book, chapter, and verse preaching to "fables" (II Tim. 4:4); I have seen churches turn from the spiritual work of saving souls to social work of catering to the body; I have seen churches turn from the power of the gospel in drawing men to Christ (Rom. 1:16; John 6: 44- 45) to all kinds of gimmicks and carnal means to draw men; I have seen a Christ-following people become a men-following people (I Cor. 4: 6; 3: 3 - 7); I have seen the majority of God's people go digressive and love to have it so; I have seen the people of God divide into two separate groups with two entirely different attitudes toward the word of God; I have seen the day when there is no fellowship between myself and those who encouraged me as a young man, even though I am preaching nothing now that was not allowed to be preached in the churches in this county twenty-five years ago. (Even though the spirit of lawlessness was already at work, sound preaching was still allowed in most places). Twenty-five and more years ago the names of brethren Franklin Puckett, Lindsay Allen and Irven Lee were household words in the homes of Christians in this county. These men were just about universally accepted as preachers. These good brethren have not changed their preaching or practice over this period of time, but none of them are anymore acceptable to the brethren as preachers today than I am. Either of the three would be welcome in the pulpit where I preach, and I ask, "Who has changed their practice?" All men who are honest know who has changed!